“A must for all chess enthusiasts” – not really a great selling slogan – permit me to rephrase. Bobby Fischer Against the World (2011) is a must for all enthusiasts of brilliant documentaries. Liz Garbus, the film’s acclaimed director, has scoped her masterful documentary eye on the now unrecognised face of Bobby Fischer, a man, the documentary exclaims, was secondary only to Jesus Christ in notoriety stakes in the early to mid 1970s in America. A chess prodigy who devoted all of his childhood in the Bronx to playing chess, reading about chess, and generally being very good at chess, he worked his way up the ranks, beating esteemed high-ranking professionals of the sport, up to representing the United States against a state-trained Soviet opponent. And then he disappeared. Fischer’s life is a relatively ordinary one, albeit subjected onto a grand stage. He was chosen as the representative of the United States to face their great enemy of the Cold War, the USSR at the most-regarded intellectual sport, chess. The film elucidates that chess became more of a sport, more representative of which war-mongering state had the more superior battle strategy. Fischer was the USA’s White Knight, attempting to puncture the Soviet dominance. Bobby Fischer Against the World teases upon falling back into a true underdog story, with Bobby’s relatively quiet but difficult upbringing cross-cut with footage of classrooms full of Soviet children being forcibly motivated to increase their chess abilities. One talking head describes Fischer as the Muhammad Ali of the chess world and from the brief but fairly intimate view we are privileged to see- although there is no direct first-hand interview with the man- this description is accurate; Fischer is charismatic, charming, extremely aggressive and obsessive compulsive. But they are both the best there has ever been in their respective sports, and both at certain times felt the wrath of the state they were at one time the flag-bearer for. Chess enthusiasts will probably revel and faint at the selection of talking heads available as well as snippets of previously unreleased footage from the World Chess Championship between Fischer and his (at least professional) nemesis Spassky. While the Spassky confrontation may seem at first to present the crux of the narrative’s antagonism, it does become apparent however it is the inner demons of Fischer and the utilization of him by the state as a mechanism of propaganda over the Communists that become the true villains. Unlike the most commercially successful documentary films, Bobby Fischer Against the World is neither current nor political, or an attempt at a sort of game-change. It does however, in these constantly changing times, offer a pause for welcome reflection to observe how childishly competitive the superpowers were (or are). What one could definitively say, however, is its offering of another patchwork to the tapestry of documenting latent Americana, a broad genre spanning from the downtown documentaries of Steve James to the Matt Damon-narrated Inside Job, an investigation into the economic crash of 2008. Fischer is just another face to fit into this extremely wide spectrum. Nonetheless, the story Garbus tells is compelling and, at times, dramatic, organised into manageable chapters and with a delicate balance on chess-related terminology to negotiate the avid fan and the extreme novice. Bobby Fischer Against the World rightly deserves to be named one of the year’s best documentaries, and as a consequence, one of the year’s best films. Read our interview with the film’s director, Liz Garbus, by following this link. 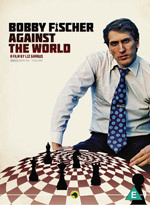 Bobby Fischer Against the World is released on DVD on 12 September, 2011.